Thanks to Malcolm AKA Dorian of House None of Your Business for the build! Hey everyone, hope you’re enjoying the new year. 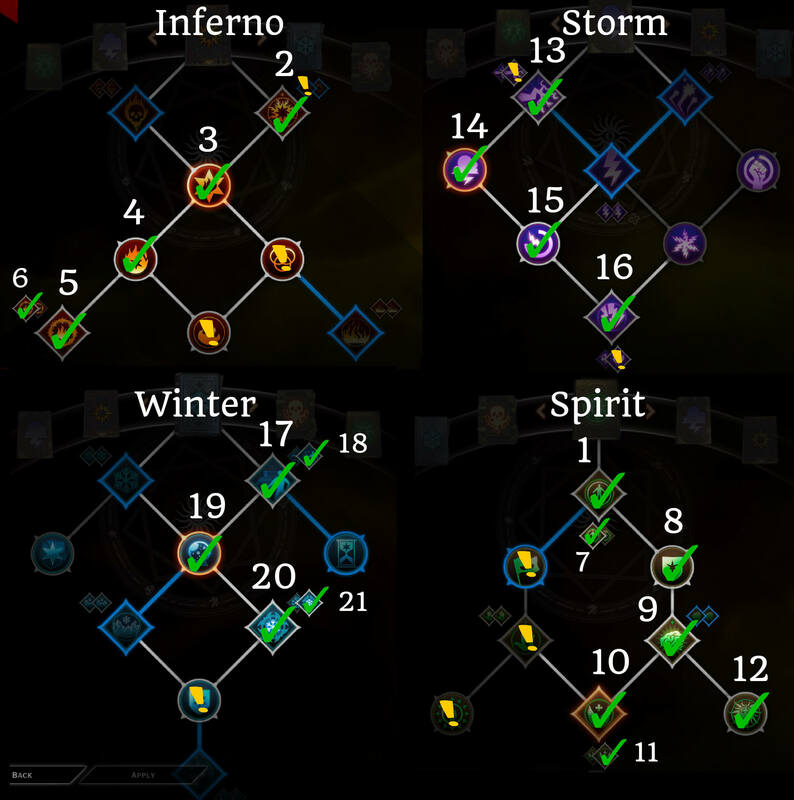 I’ve got a new mage build to talk about today – the Elemental Mage. This build is similar to the “Jack of All Trades” in that it doesn’t take any specialization skills and gives you many options. With 2 spells from every tree you can deal with almost any situation and enemies with specific resistances. With access to 4 different spell schools, this build has high damage and also allows you to support at the same time with barrier and revival. In particular, you have high AOE damage and control because all your skills are AOE, and good mobility and mana regen with upgraded Fade Step. And because you don’t need any specialization skills, you can use this build on any one of your mages. Given that this build takes skills in all 4 mage trees, you have a lot of choice on what to level first and there’s no clearcut “best” way. Generally speaking though, I would always start with barrier and then grab the Inferno skills to get upgraded Fire Mine ASAP to boost your damage. After this you can finish your Spirit skills and pick up revival so you don’t have to worry about keeping the party alive. Then you can choose to get either the Storm or Winter skills first, depending on preference. Upgraded Fade Step in particular can be picked up whenever you start having mana issues, and Ice Mine is great if you feel like you’re lacking in CC. Thanks for including my build!